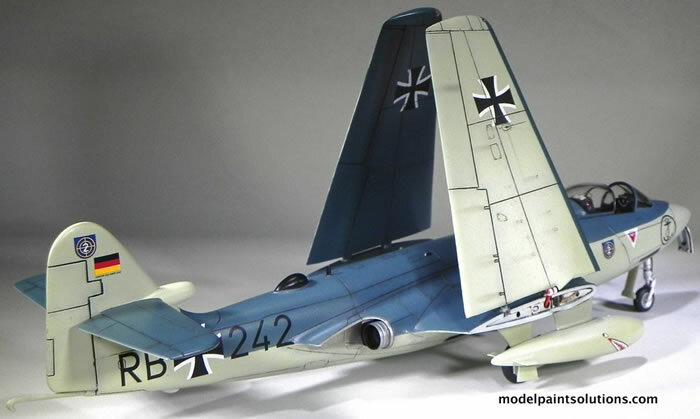 42 parts in grey styrene, 1 clear part, 22 resin parts, 18 photo-etch parts, and one decal sheet with markings for 2 airframes. 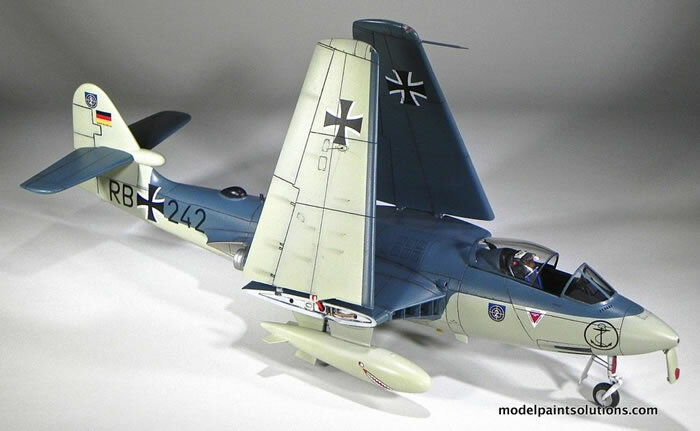 Beautifully poured resin components with a nicely detailed cockpit, wheel wells, and quality decals; resin and PE parts for folded wing option..
No open canopy option; fuselage requires structural reinforcement; resin components require thinning to achieve fit. 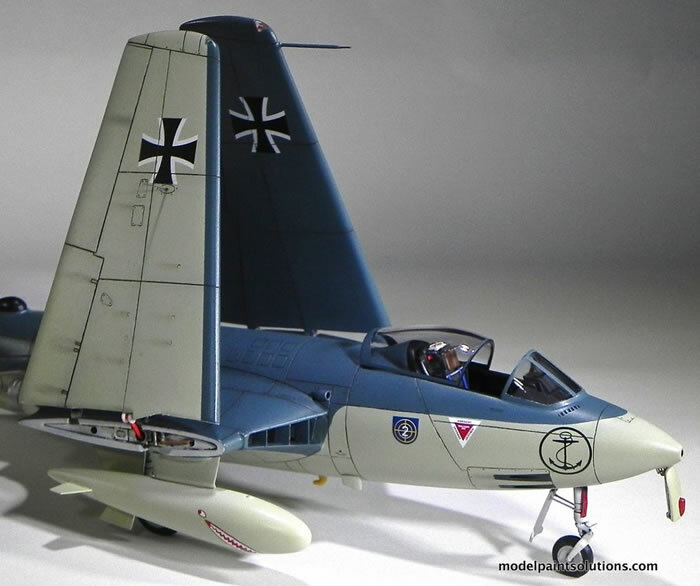 This is a nice kit of an absolutely beautiful airplane. Extra work is required to fit the resin parts and deal with the PE intake fins but the result is well worth the time invested. 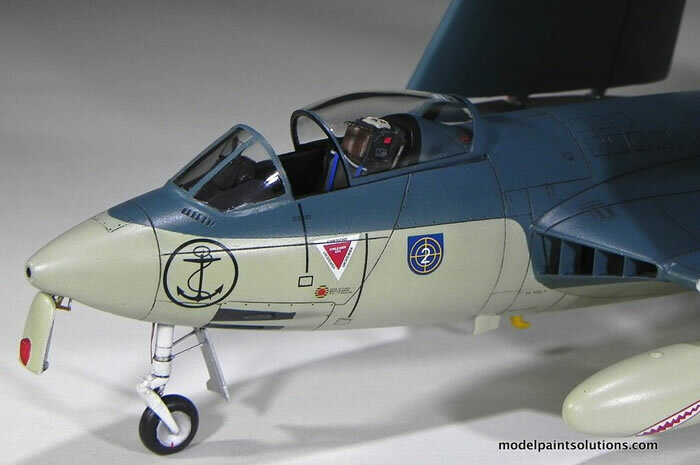 The Hawker Sea Hawk is a British single-seat jet fighter of the Fleet Air Arm (FAA), the air branch of the Royal Navy (RN) that was built by Hawker Aircraft and its sister company, Armstrong Whitworth Aircraft. Although its origins stemmed from earlier Hawker piston-engined fighters, the Sea Hawk became the company's first jet aircraft. Following the type's acceptance in the RN, the Sea Hawk proved to be a reliable and sturdy workhorse. A considerable number were also produced for the export market, and were operated from aircraft carriers in both Dutch and Indian service. The last operational Sea Hawks, operated by the Indian Navy, were retired in 1983. 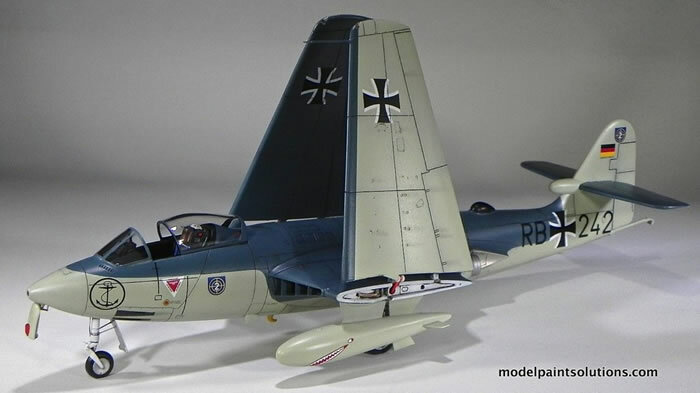 On 2 September 1947, the P.1040 prototype, VP401, sometimes referred to as the Hawker N.7/46 after the related naval specification, conducted its maiden flight from RAF Boscome Down, piloted by Bill Humble. Three days later, VP401 flew to Farnborough to continue trials. 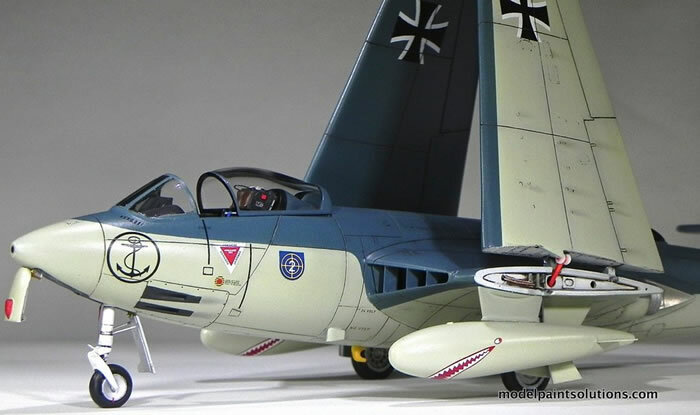 A month after the first flight, the existence of the P.1040 was revealed to the general public. 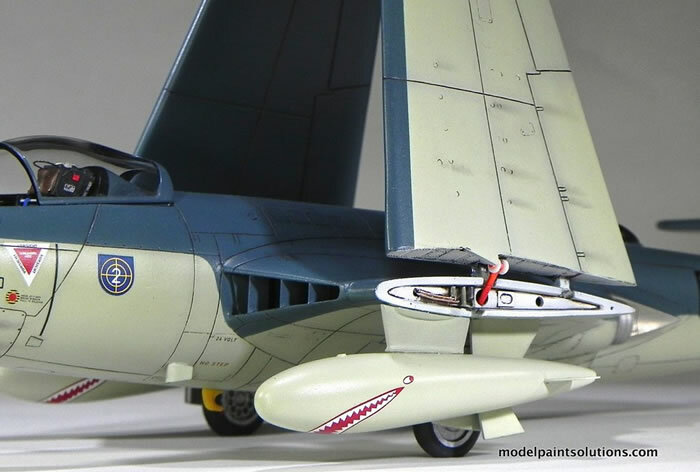 Early flight trials encountered aerodynamic-related teething problems, such as airframe vibrations and tail buffeting, which led to a redesign of the rear jet pipe fairings and the addition of a bullet-shaped anti-shock body on the tail. Other minor issues including high stick forces and windshield distortion were also addressed. The long takeoff runs VP401 needed were attributed to the "low-thrust" Nene 1. 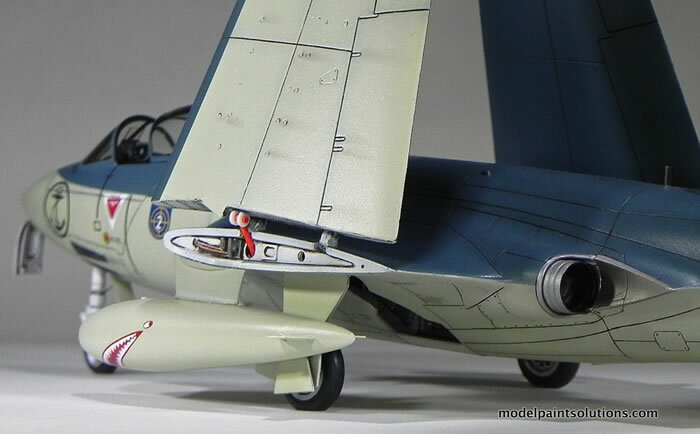 The Nene 2 intended for production aircraft would provide a higher take-off thrust. 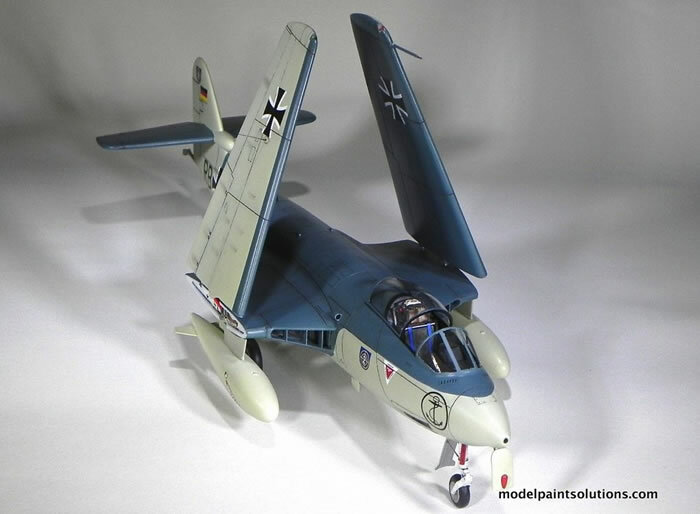 On August 31, 1948, a fully navalized prototype, VP413, equipped with folding wings, catapult spools, and a full armament, conducted its first flight. VP413 was quickly subjected to a series of deck assessment trials using a mockup deck at Boscombe Down. In April 1949, VP413 was transferred to the aircraft carrier HMS Illustrious to conduct general deck and handling trials at sea. These trials revealed the need for the wingspan to be increased by 30 inches, the low-speed handling of the prototype having been found to be lacking. In November 1949, VP413 was re-deployed to Illustrious, performing around 25 deck landings without issue. On 17 October 1949, the third prototype, VP422, made its maiden flight. 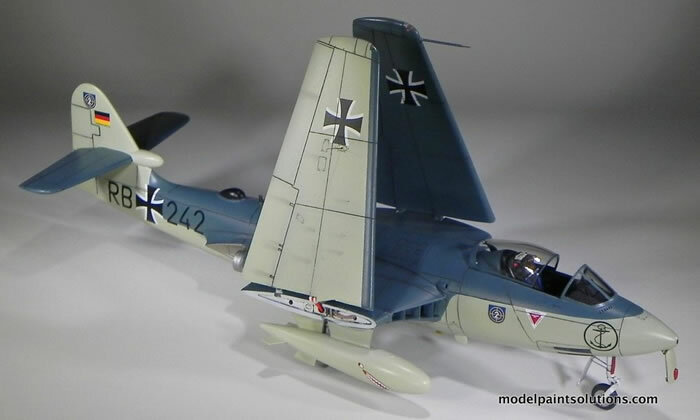 Being representative of the subsequent production aircraft, VP422 incorporated a number of modifications as a result of the experiences gained from trials with the second prototype. These alterations included the fitting of a longer arrester hook when a number of "bolters" were experienced during the early dummy deck trials. The longer hook was incorporated on the remaining production runs. Other changes included the addition of fixtures for rocket-assisted take-off gear (RATOG) and hard points plumbed for external drop tanks. 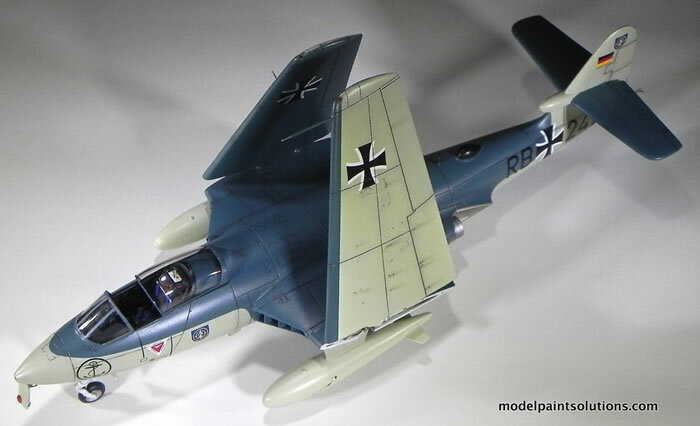 On 22 November 1949, Hawker received an initial production contract for 151 aircraft. The aircraft also received the name Sea Hawk at this point. Throughout 1950, both VP413 and VP422 were used to conduct preliminary service trials. Interestingly, VP401, the first prototype, continued to serve in the flight test program and was involved in two significant events prior to its retirement. On 1 August 1949, the Royal Navy entered VP401 in the National Air Races, in which it won the Society of British Aircraft Constructors (SBAC) Challenge Cup Race, beating out both a Vampire 3 and de Havilland DH.108. VP401 was later converted into a further prototype, the Hawker P.1072, the principal addition being in the form of an auxiliary rocket engine becoming the first British rocket-powered aircraft. After a few flights were made in 1950, the rocket engine blew up during a test and although repaired, the airframe was scrapped soon after. Immediately following the receipt of the first order in November 1949, Hawker set about establishing a manufacturing line for the Sea Hawk at their Kingston facility. Shortly after the outbreak of the Korean War, an urgent operational demand for Britain's aircraft carriers, and thus their accompanying aircraft, had become apparent. In order to cope with this demand, address production shortcomings, and cope with the pressure that Hawker was facing with the development of the new Hunter, it was decided that production would be transferred to a new assembly line run by Armstrong Whitworth Aircraft (part of the Hawker group at Coventry). Prior to the transfer, a total of 35 Sea Hawk F1’s built to the initial production standard, were completed at Kingston. 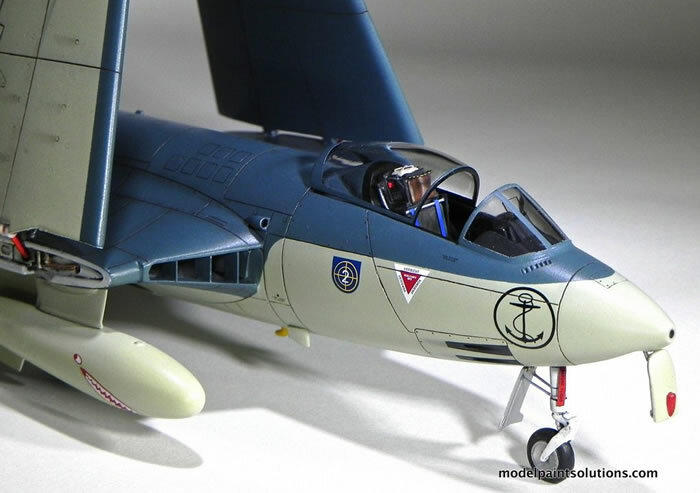 On 14 November 1951, the first production Sea Hawk F1, WF143, conducted its maiden flight possessing a wingspan of 39 ft (12 m) and a tail plane of increased area. The first Coventry-built Sea Hawk F1 made its first flight prior to the end of 1953 with a total of 60 being produced. While some of the initial batch of Sea Hawks would see operational service, many of the F1 aircraft would be used for various service trials. 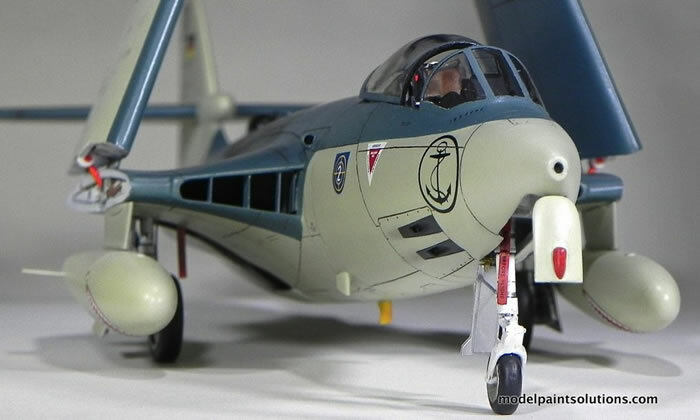 Amongst these, WF143 would later be rebuilt as the prototype for the Sea Hawk F2, featuring power-assisted ailerons to address a weakness in lateral control leading to instances of oscillation. 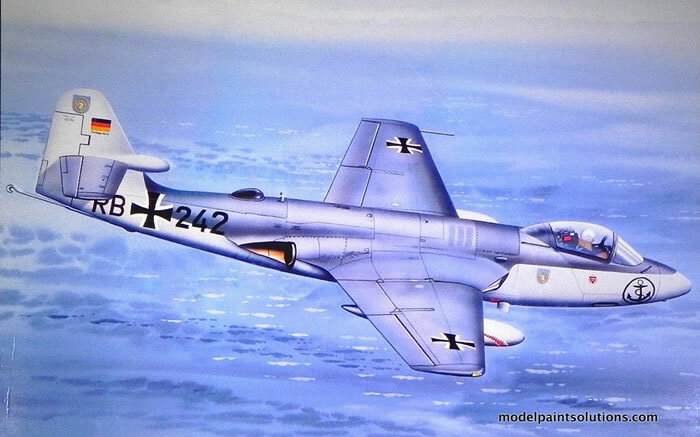 On 24 February 1954, the first production Sea Hawk F2, WF240, conducted its maiden flight with a total of 40 F2 aircraft produced. In 1950, it was acknowledged that the Nene 101 engine was to be a transitional power plant until the more powerful Nene 103 was available. The Admiralty quickly ordered that many of its Sea Hawk FB 3 and FGA 4 be re-engined. 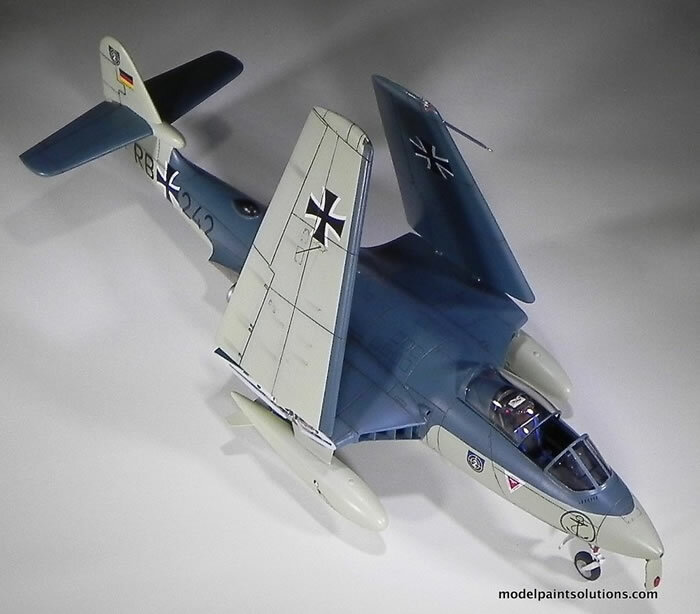 Accordingly, another two Sea Hawk variants were developed. The FB 5 which was more or less identical to the FB 3, differing by being re-engined with the newer Nene 103 engine. 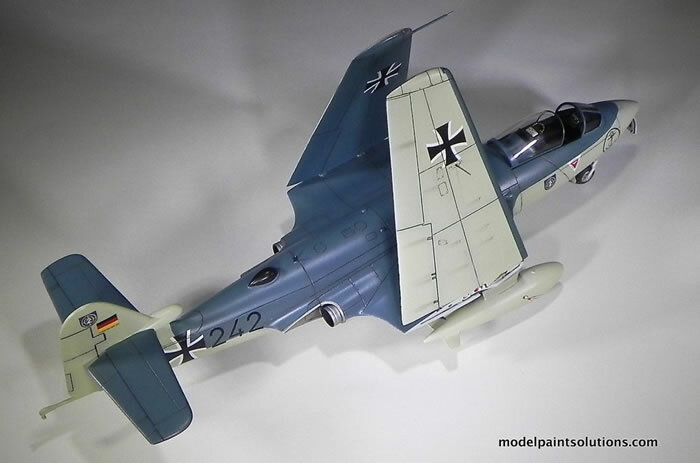 The final Sea Hawk, FGA 6, was a fighter ground-attack variant that was exactly the same as its FB 5 predecessor, although were new-build aircraft rather than re-engined airframes. A total of just 90 FGA 6s were completed. The first production Sea Hawk was the F 1, which first flew in 1951 and entered service two years later with 806 Squadron. The type was first based at Brawdy then transferred to the HMS Eagle. All Sea Hawks were in service by the mid-1950s and eventually over 500 were built. During service evaluations of the Sea Hawk, both Australian and Canadian pilots from each of their respective naval services would fly examples of the aircraft, and there were official suggestions they would adopt the type as standard equipment. However, both nations were also interested in new American-built naval aircraft; only a handful of Sea Hawks would be transferred to either nation, notably some would operate from the flight deck of the Australian Majestic class aircraft carrier HMS Sydney, though these did not enter full squadron service. 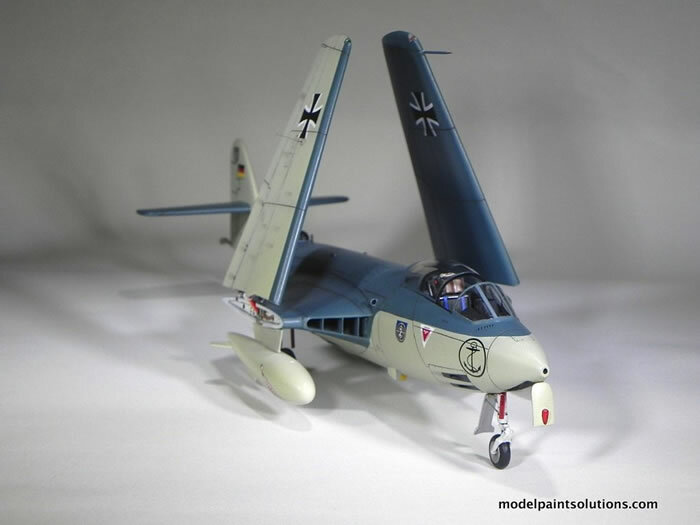 In 1956, shortly after the termination of the Sea Hawk production line, the Federal Republic of Germany placed an order for 64 aircraft to equip the German Bundesmarine (West German Navy), having determined the type to represent good value for money. Requiring both fair-weather daytime fighter bombers and day time fighters with a bad weather flight capability, these were delivered in two separate variants. 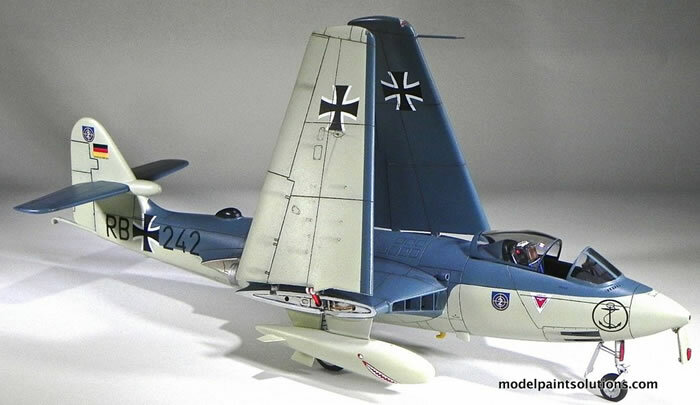 The first of these German export variants, for the fair-weather role, was designated as the Sea Hawk Mk 100, while the bad-weather capable model was designated as the Sea Hawk Mk 101. Thirty-two of each variant were ordered. The Mk 101 was equipped with a pod-based EKCO-built search radar for sea reconnaissance. 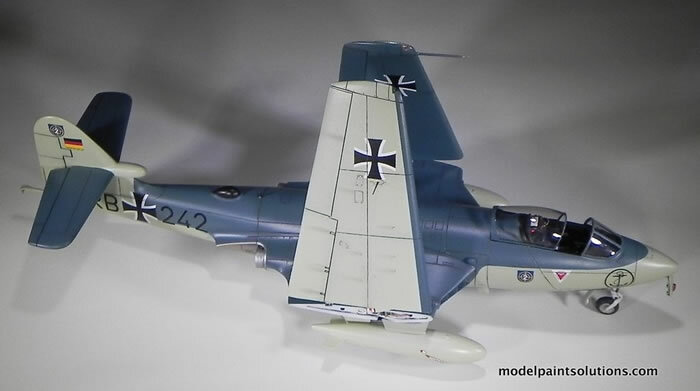 The German Sea Hawks served into the mid-1960s, until being replaced by the F-104 Starfighter. The Sea Hawk, as part of the Fleet Air Arm, saw extensive service during the Suez Canal Crisis of 1956. During the conflict, six Sea Hawk squadrons took part: two aboard the fleet carrier HMS Eagle and two each aboard the light fleet carriers HMS Albion and HMS Bulwark. 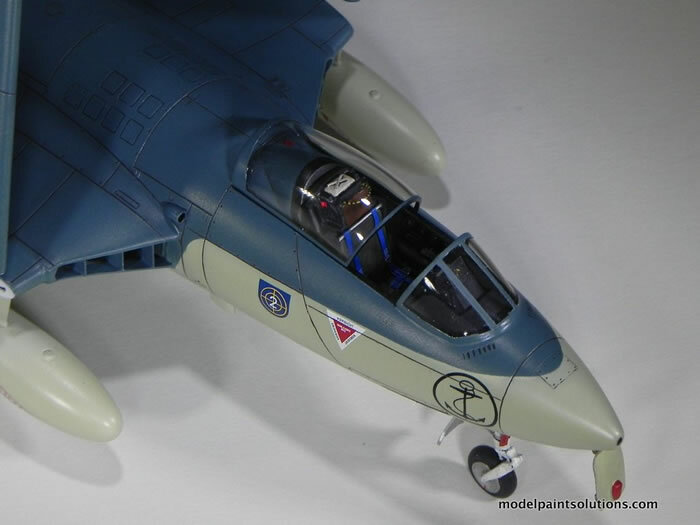 The Sea Hawks were primarily used to perform ground attack missions in the theatre due to the Hawker Hunter’s lack of range and clearance to deliver munitions. Thus, the entire British ground attack capability during the conflict was delivered by Royal Navy Sea Hawks typically escorted by de Havilland Sea Venom fighters. Sea Hawks launched many attacks upon Egyptian shore-based targets, often in the face of heavy anti-aircraft fire, resulting in several aircraft being severely damaged. The military aspects of the Suez Campaign were deemed successful and all invasion forces were withdrawn by 1957, though the waterway was reopened to Israeli ships. 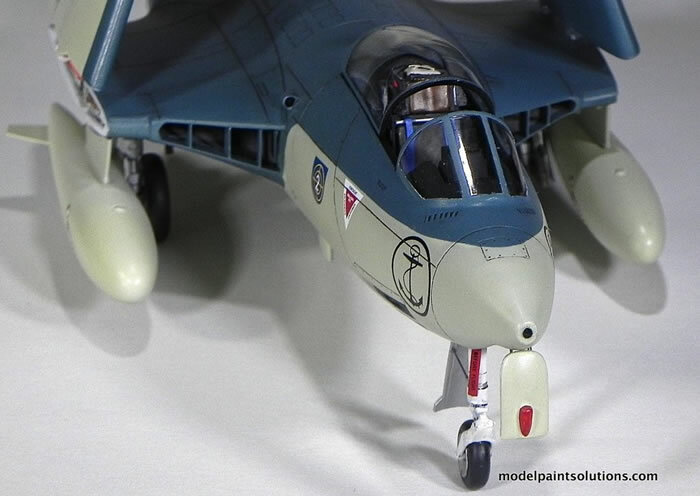 The Suez Crisis was to be the final note of Sea Hawk combat operations with the Royal Navy as a new generation of strike aircraft were introduced in the aftermath of the conflict including the de Havilland Sea Vixen and Supermarine Scimitar. The Sea Hawk was a successful export aircraft. In the Royal Netherlands Navy, it served aboard the Dutch aircraft carrier HNLMS Karel Doorman, ex-HMS Venerable, including decolonization operations guarding against Indonesian threats in the area. 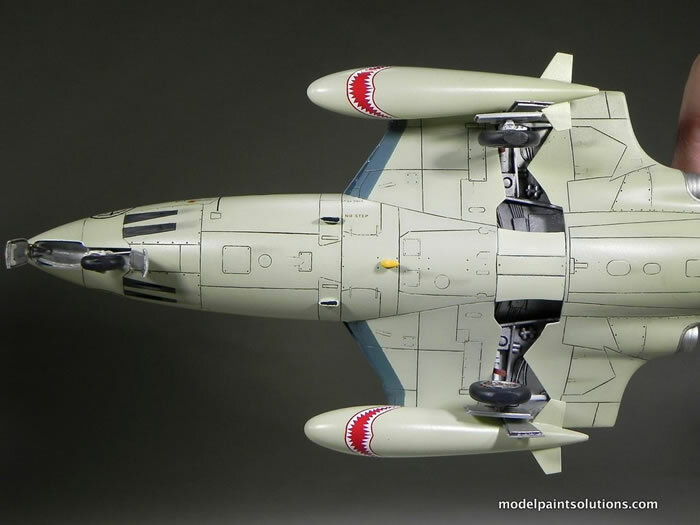 From 1959 they were equipped with Sidewinder missiles significantly enhancing and extending their air-to-air combat capabilities. In 1961, the Sea Hawks that served on her were moved ashore when the NATO mission profile was changed to all ASW aircraft. By October 1964 they had been taken out of service. In Indian Naval service (beginning in 1960), Sea Hawks were used aboard the aircraft carrier INS Vikrant, ex-HMS Hercules and saw service during the Indo-Pakistani War of 1965 and the Indo-Pakistani War of 1971. The latter war saw Sea Hawks being used by the Indian Navy. These aircraft scored nearly a dozen "kills", mainly of Pakistan Navy gunboats and Merchant navy ships and cargo ships in East Pakistan (present day Bangladesh) without losing an aircraft in the war. Aided by Breguet Alize aircraft, the Sea Hawks emerged unscathed, achieving the highest kill ratio for any aircraft in the war. The Sea Hawk was withdrawn from Indian Navy service in 1983, being replaced by the far more capable BAE Sea Harrier. The Sea Hawks in Fleet Air Arm service began phase-out from first line service in 1958: the same year the Supermarine Scimitar and de Havilland Sea Vixen entered service. 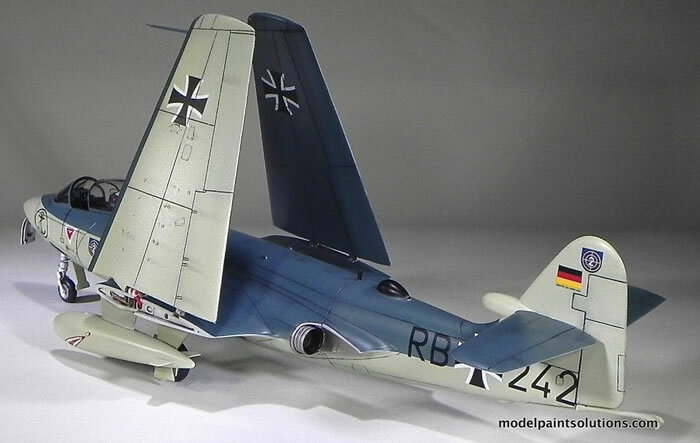 The last front line Sea Hawk squadron, No. 806, disbanded at RNAS Brawdy on December 15, 1960. Sea Hawks in second line service were withdrawn by the mid-1960s. The last operational Royal Navy Sea Hawks were FGA.6’s flown by the Airwork Limited managed "black" Fleet Requirements Unit based at Bournemouth (Hurn) Airport, which retired the type in 1969. Thirty-six complete Sea Hawks (plus eight cockpit sections) are known to survive as of 2011 mainly in a variety of locations in the United Kingdom, though others are located abroad, including Germany, Malta, the Netherlands, and India. One Sea Hawk, WV908, remains airworthy as part of the Royal Navy Historic Flight in the UK, although refurbishing the aircraft including fitting a Nene 103 took place in 2009. The Hawker Hawk is one of the more aesthetically pleasing aircraft from that early period of straight-winged jets. 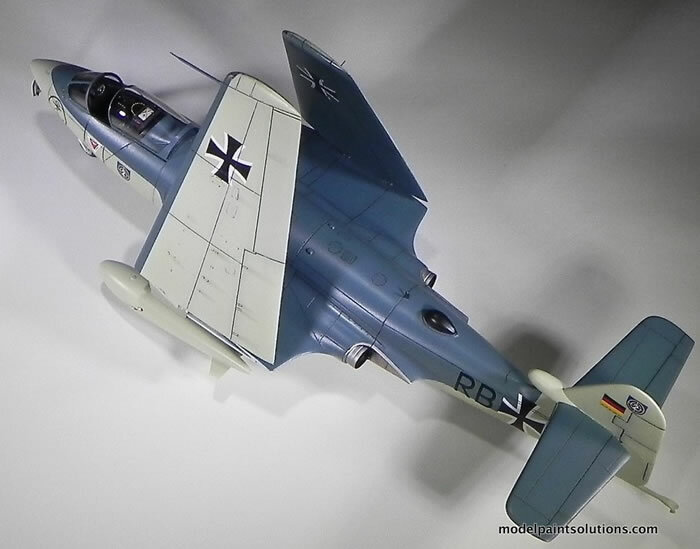 I’d wanted a model of this aircraft on my shelf for many-a-year and stored my Classic Airframes Sea Hawk in ye olde stash until I had accumulated sufficient experience with limited-run kits to give it a go. This is no “shake ‘n bake” kit: far from it. Construction required continual test fitting and modification of multiple parts to achieve a good fit. The result however gave me a real sense of accomplishment and resulted in a pretty eye-catching model right out of the box. The result was worth the wait! Assembly starts with the pilot’s office, which is provided as a hefty resin cockpit tub and seat. 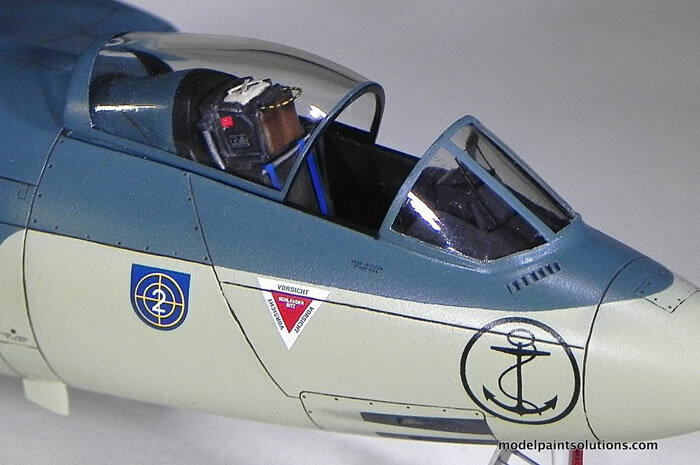 The details are beautifully rendered on all of the cockpit components and really popped with a bit of careful detail painting. The seat, well-molded and nicely detailed, looks convincing under paint and a little panel wash. 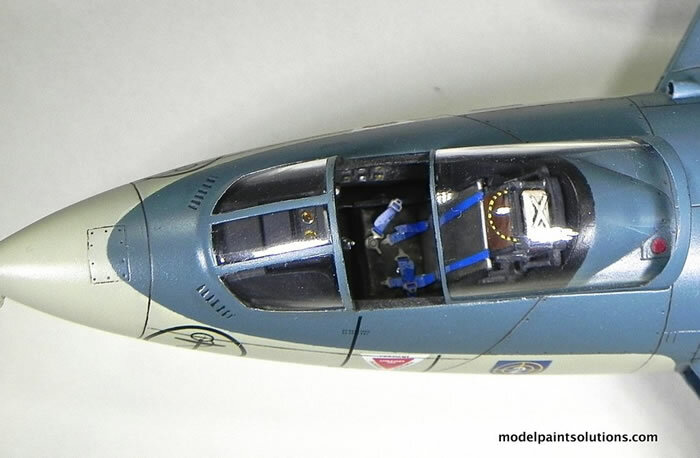 The blue seat harness was added from the spares box (Eduard) and it really ties the cockpit together; does it not. 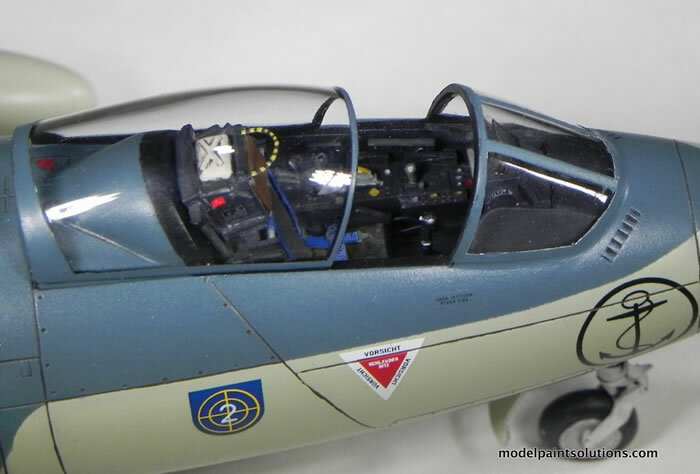 The fit of the cockpit tub into the lower and upper halves of the forward fuselage required very little adjustment. The same can’t be said for the resin main wheel well plug, which required appreciably thinning to achieve a reasonable fit. 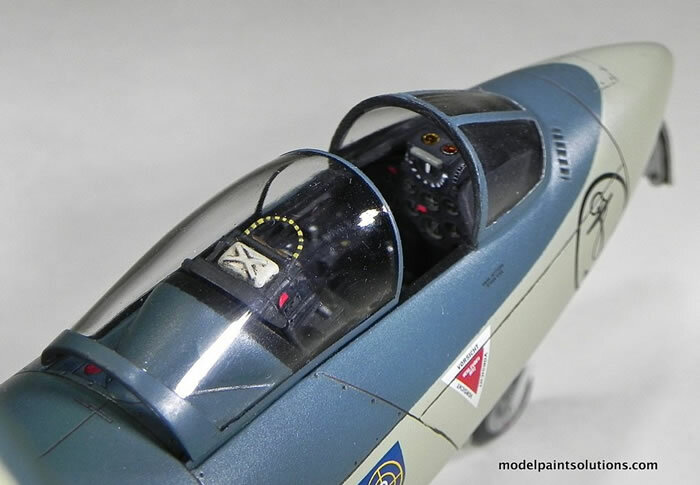 The windscreen was separated from the sliding portion of the canopy with a razor providing a better view of the nicely detailed cockpit. The profiles of the front and rear sections of the fuselage didn’t quite match on my copy. The contours between these pieces required filling and blending with abrasives. In preparation for painting the model was sprayed with Mr. Surfacer 1500 applied as thinly as possible to retain inscribed details. 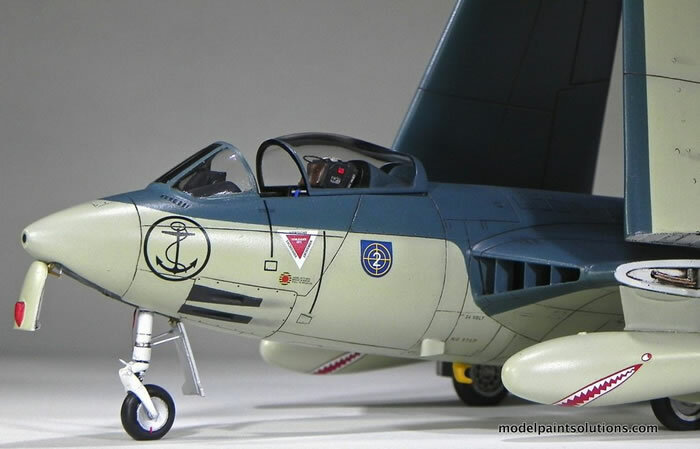 The kit decals are beautifully printed with excellent registration. 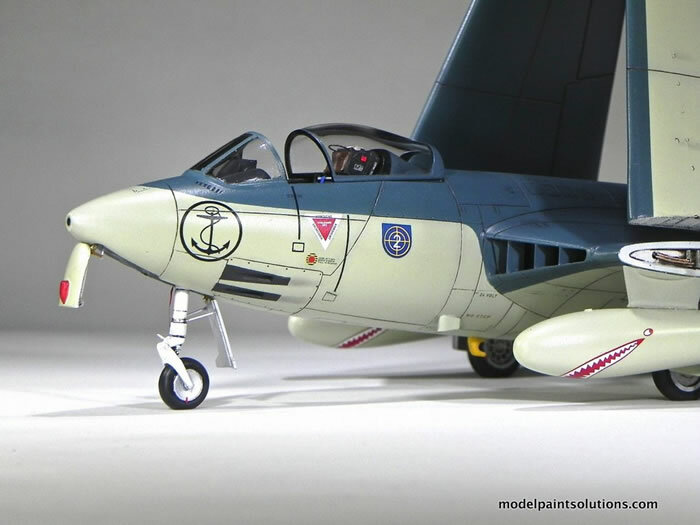 The marking options include a Sea Hawk of the Indian Navy (INS Vikrant) and one that served with the West German Navy (MFG 2) in the early 1960’s. 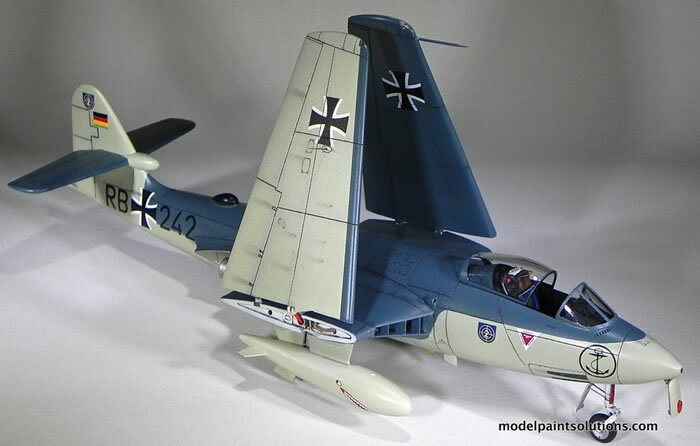 I opted to do the German Mk.101 in part because of the attractive anchor nose marking beautifully reproduced on the decal sheet. All of the paints were applied using a Harder&Steenbeck Infinity fitted with a 0.2mm tip. The model was shot with LifeColor Sky (#UA-095: lightened ~5% with LifeColor White) and LifeColor Dark Sea Grey (#UA-516). 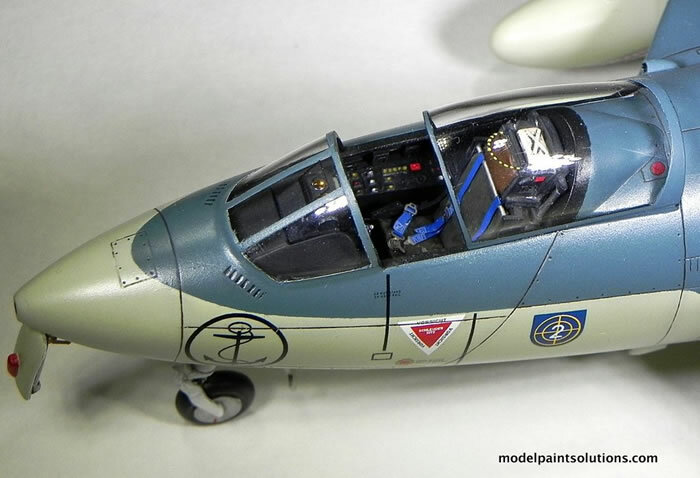 The kit decals were applied over coat of Future using Micro-Set and -Sol. 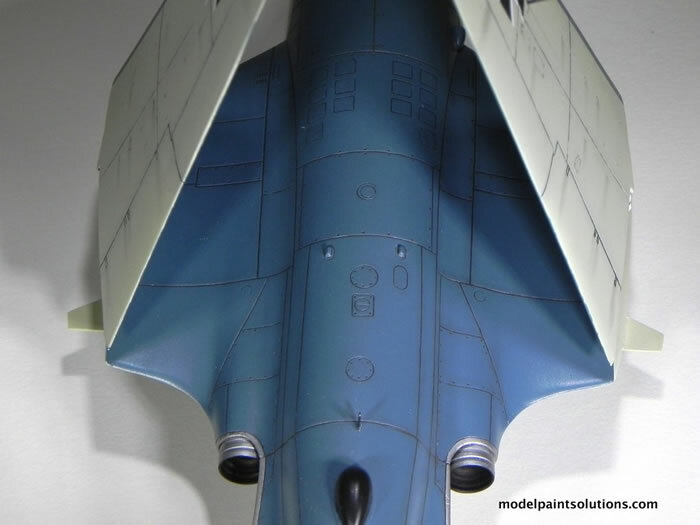 After enamel panel liner (Tamiya) and some light weathering with pastels, the finish was sealed with a light coat of Vallejo Semi-Matte. I enjoyed building this kit. 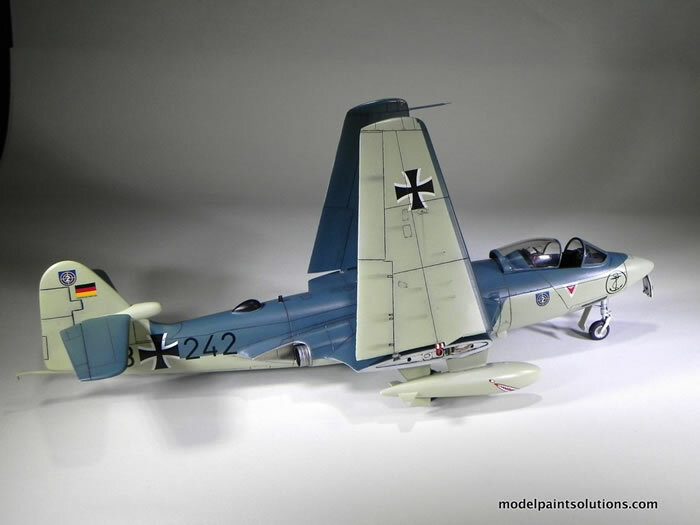 Classic Airframes kits are the result of limited production runs meaning they require a bit more care and patience to assemble. 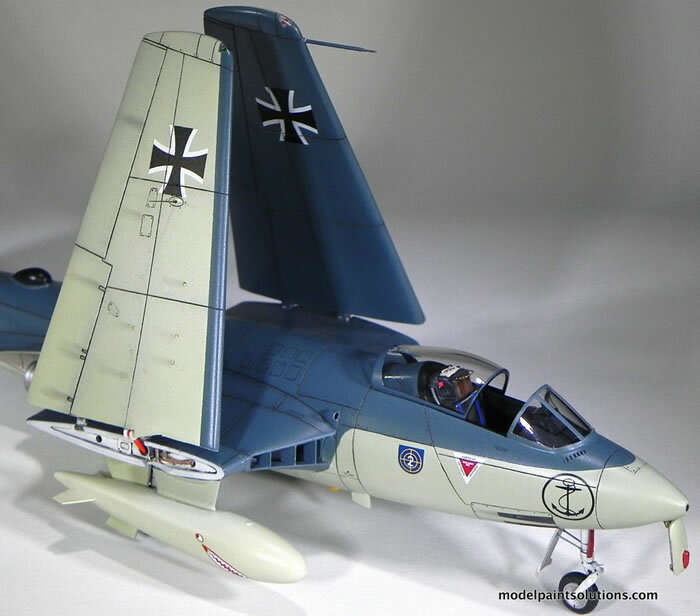 That said, this kit presented no issue that couldn’t be handled with a little patience and experience and the result is an eye-catching model not often seen at model shows. 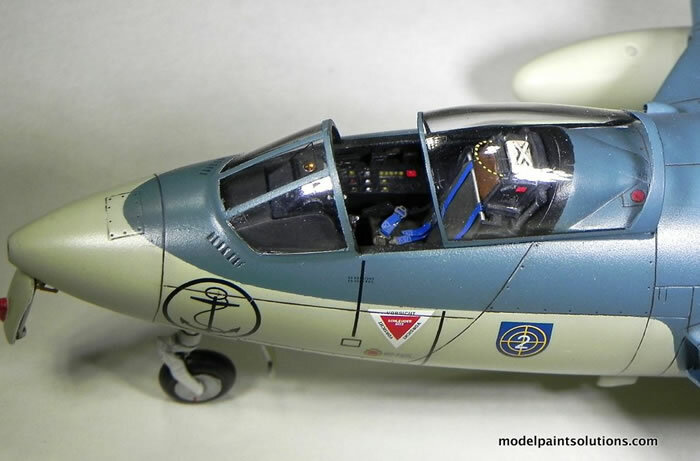 The Classic Airframes Sea Hawk has been out of production for a while but if you stumble upon one at a model show/meet, pick it up: you won’t be disappointed.